Faith Cheruiyot was admitted to the bar in 2007. She started off her training in the firm of Kipkorir Titoo & Kiara Advocates between 2005 and 2006 where she trained in diverse areas of law. She later joined the firm of Raffman Dhanji Elms and Virdee where she trained in banking and finance, real estate transactions, Intellectual Property disputes, regulatory compliance, corporate advisory and governance amongst others. Seeking corporate experience, she joined Standard Chartered Bank to manage legal and compliance issues for Kenya’s retail business. She was engaged in providing general legal advisory on banking transactions, financing arrangements, drafting and reviewing commercial agreements and managing regulatory and compliance issues for the Bank. 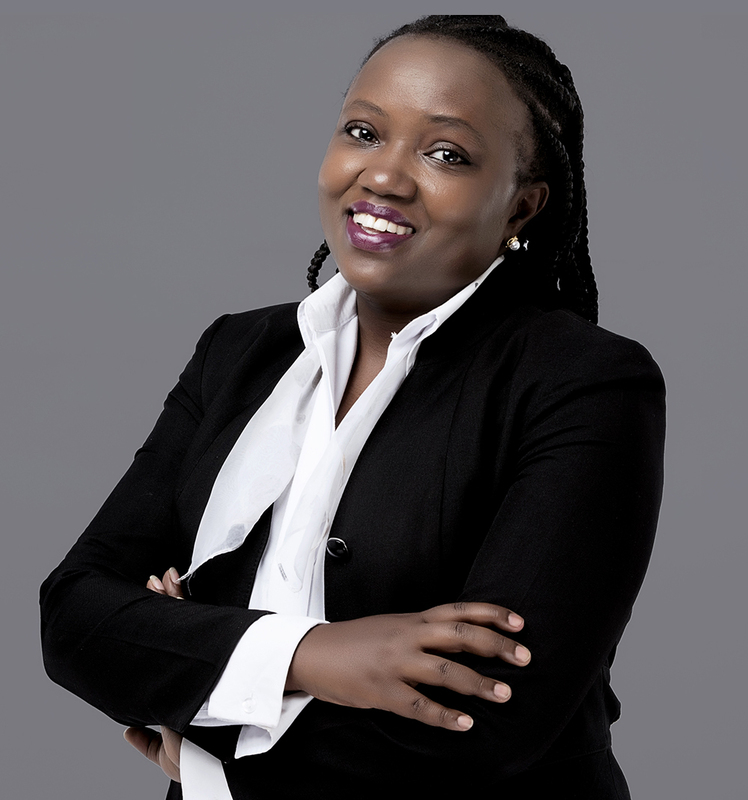 She holds a Master of Laws Degree (LL.M) in International Legal Studies from Washington College of Law and an LLB Degree from University of Nairobi. Faith represents clients on a wide range of commercial transactions including mergers, takeovers and acquisitions, sale and purchase of assets and businesses, Intellectual Property, registration of Trademarks, Copyright, Patents and contractual licenses, intellectual property rights, conveyancing and real estate transactions. She also gives advisory on structured financing options, syndicated loan agreements, bank guarantees, perfection of bank securities, letters of credit, generally international trade documentation, import and export of goods, sale of goods, corporate governance, regulatory compliance, procurement law, public private partnerships, both for private entities, government corporations and parastatals and county governments advisory on the workings of the Capital Markets Authority, investment agreements etc. • Advisory: Offering legal advisory to the biggest Multi-National Banks in Kenya, on Kenya’s applicable legal and regulatory compliance framework, advising the Banks on all retail and corporate regulatory needs, preparation of the Bank’s Compliance manuals, interpretation of new laws affecting operations of the Bank, Anti money laundering checks and undertaking legal audits. • Product Creation: Acted for the bank in seeking approvals from the regulators for the launch of new products including the multi-million Bancassurance business and Islamic Banking products, negotiating and reviewing terms with partner insurance companies, contract drafting, incorporating of the requisite subsidiary entities, preparation of the documentation for the necessary approvals. • Regulator Negotiations: Represented Standard Chartered Bank in holding negotiation meetings with the Regulators, lobbying and making presentations regarding a variety of issues and the status of the Bank in complying with various laws and regulations; such as Anti-money laundering, accounts management, lending, fees, introduction of new products, internal audits, introduction of digital banking channels, statutory reporting etc. • Securities and Document Perfection: Acting for Standard Chartered Bank, Equity Bank, the largest Bank in East Africa Region by customer and various SACCOs to undertake document drafting, preparation, stamping, registration and perfection of bank securities and the requisite due-diligence related to securitization. Commercial- Acting as one of the Advisors to a joint-venture Geo-thermal energy investment transaction involving an entity from Brazil and Kenya to bid for and jointly undertake a Government energy project. The work entailed drafting joint venture agreements, incorporation of a Special Purpose vehicle, preparation of the requisite financing and Shareholder Agreements, meeting and holding negotiations with the Ministry of Energy, interpretation of the energy regulations, taxation requirements, power-purchase agreement review which enabled the entities to commence their operations. Intellectual Property- Acting for an international investor in compiling, advising and ultimate registration of a valuable patent at the Kenya Industrial Property(KIPI) Institute and providing guidance for their centralized registration at the Africa Regional Industrial Property Institute (ARIPO) in Harare Zimbabwe. International Trade Finance- Negotiate, structure financing options for all types of international and cross border trade for a major undisclosed client, drafting and reviewing letters of credit, obtaining requisite bank guarantees, generally international trade arena and documentation relating to import and export of goods and cross border sale of goods. Undertaking advisory on the workings of the Capital Markets Authority, drafting and reviewing investment agreements, highlighting investments risks and appetites, advising on matters offshore investment agreements for registered Funds and other entitites and cross border investments generally. New Laws: Training over 150 representatives of the members of the Kenya Bankers Association on the interpretation of various laws affecting their industry including but not limited to the Credit Reference Bureau Regulations, the Consumer Protection Act, the Marriage Act and its effect on their lending operations, the Bancassurance Regulations, Operation of Incidental Businesses guidelines and the Land Act Regulations. Business Affairs: Was the lead trainer to the Nakuru Business & Corporate Community organized by the Kenya Chamber of Commerce on various aspects relating to corporate law where upto 20 institutions were represented. The presentation covered company registration, types of shares, settlement of shareholder disputes, rights of shareholders, Corporate Governance and other relevant Board matters. Represented The Estates Ranches, a land investment Company from the US, on the legal structure for acquisition and development of Ranches worth 3,000,000 USD around the Maasai Mara and Laikipia areas. My assignment involved negotiating Leases with the local communities, drafting and registering them, incorporating of private land holding Companies and providing options for foreign entities can legally own agricultural land in Kenya. The work also entailed negotiating and drafting agreements for the purchase of movable assets located at the Ranches not forming part of the land. Advising international investors on the procedures for investing in real estate projects in Kenya, the legal requirements, financing options, security options, drafting various agreements with project partners being (architects, quantity surveyors, construction contractors), undertaking land sub-division, obtaining change of user certificates and Title Deeds from the Registrar of Lands. I am also engaged in negotiating the terms of sale and any tax aspects arising from the land transactions.